Identical in almost every way to the Galaxy S4, Samsung tweak their flagship handset to make it water and dust resistant. Its Aqua Mode allows you to capture underwater shots by pushing a physical key instead of using the touchscreen. Apart from a slight drop in camera quality (the main camera is 8 megapixels instead of 13), Samsung have made sure that the S4 Active mirrors the performance of the original S4 in virtually every way. f you spend a lot of time outdoors but desire a handset which looks fantastic and performs brilliantly, then this is your ideal choice. If you're in the market for the best Android handset currently available, this is a solid choice, especially when you consider the added benefit of IP67 certification and a more distinctive case design. The increased resilience to the elements might seem like a gimmick, but not having to worry about getting your phone wet when you're waiting for the bus on a raining evening is actually more of a blessing than you might think. It's also hard not to prefer the rugged appearance of the S4 Active - the revised casing and physical buttons below the screen are sure to strike a chord with many who considered the standard S4 to be too similar to the S3. Unless you're desperate for a paper-thin phone, I'd recommend this over the S4. 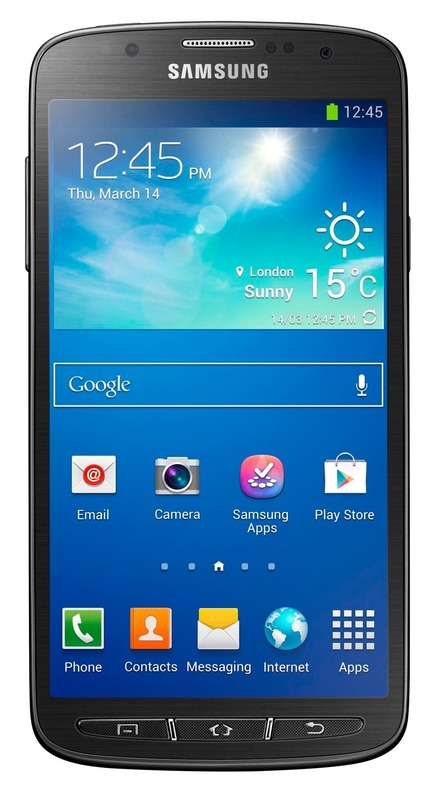 The Samsung Galaxy S4 Active packs almost all of the original's excellent features into a robust waterproof frame. A scaled-back camera is the only casualty. We can warmly recommend the Galaxy S4 Active to anyone who likes to be outdoors a lot. You'll get a robust smartphone with up-to-date technology. No matter how we look at it, the Samsung Galaxy S4 Active is a pretty awesome smartphone. It is one of the very few devices that are tough enough to resist some serious dust and water damage, yet good-looking and extremely capable at the same time. It's marketed as a phone for active people, but we think it's actually a better fit for moderately active users - everyday users like you and I who might get outdoorsy once in a while. It's not robust by far, but it will take away any day-to-day worries about things like dust and raindrops that threaten a normal, delicate smartphone. We definitely like the Samsung Galaxy S4 Active. Of that, there is no doubt. The build is solid, if unsexy, the performance is top notch, the underwater camera is excellent and the screen is both sensitive and packed with Full HD detail. The only issue we'd have, aside a touch-and-go battery life and a set of fun features that don't always work, is over how active it really is. Should you pick the Galaxy S4 Active over the Galaxy S 4? Ultimately it comes down to what you need your phone to do. Enjoy texting from the bathtub, or simply prone to spilling the occasional glass of water? The Active is probably the better choice. Want the absolute highest-end specs, from camera to display to battery life? The original Galaxy S 4 is definitely the better bet. The Active is one of the best smartphones made by Samsung in recent years, offering users all the key strengths of the Galaxy S4, but coming with a beefed-up, more robust design. If you're looking for a Galaxy device with less reliance on plastic, yet that still has a bit of oomph in terms of power, this is a great pick. The Galaxy S4 Active isn't quite as rugged as its name suggests -- despite the water and dust proofing, and the Corning Gorilla Glass covering the display, there's not a lot of protection against dropping it. Still, it could certainly take the original S4 in a fight, and with some fairly minor economies on the screen and camera, it offers a similarly high spec to the original S4. The Samsung Galaxy S4 Active is a powerful, feature-heavy Android phone, and one that has most of the benefits of a Galaxy S4 with added waterproofing. However, calling it a true rugged phone is pushing it, and the camera isn't a match for the S4's. This is essentially a more solid version of the S4 [subscription required for full access to review]. The Samsung Galaxy S4 Active brings the power of the Galaxy S4 into a more ruggedised body, and it's fantastic. Every day, we search through thousands of tariffs and offers from UK online retailers to find the best Samsung Galaxy S4 Active deals and contracts across a selection of price points and needs. Select 'Pay Monthly' if you're looking to get the Samsung Galaxy S4 Active as part of a monthly contract with minutes, data and texts. Alternatively, choose 'No Contract' if you prefer to buy the Samsung Galaxy S4 Active SIM Free or on Pay as You Go. Finding the perfect deal is easy. Just use the sliders to filter tariffs for minutes, data, monthly cost and upfront cost. You can also filter by network and retailer to find the best Samsung Galaxy S4 Active deal for you! The cheapest contract price in this category is cheaper than buying the Samsung Galaxy S4 Active SIM Free and a comparable SIM Only tariff by . You could save on the cheapest contract price in this category by buying the Samsung Galaxy S4 Active SIM Free and a comparable SIM Only tariff separately.